If you planted zucchini this summer, like I did, you are probably racking your brain to come up with new ways to prepare it. Thankfully there are countless recipes available on the internet. But if you are looking for an elegant appetizer, look no further. 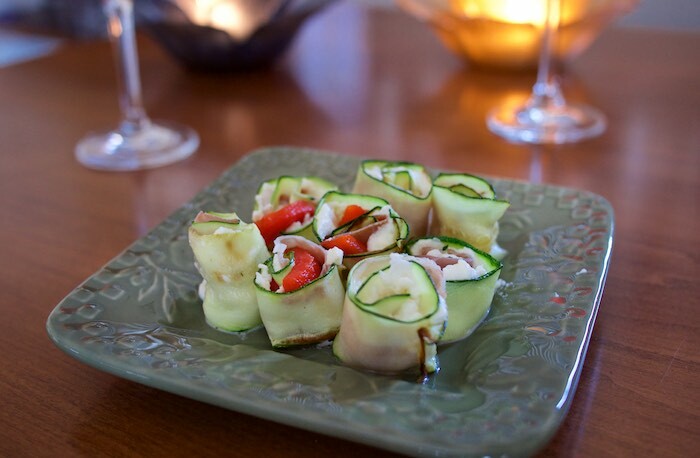 Zucchini bites are a delicate, full of flavor appetizer that can easily be made in advance. They are perfect for parties, as they can effortlessly be popped into your mouth with one hand as you balance a drink in the other. What makes these zucchini bites even more spectacular is that you can customize them any way you like. Not a meat lover....leave out the prosciutto. Switch the cheese from ricotta to goat. The possibilities are endless. Brush the zucchini slices with a small amount of olive oil on both sides. Season lightly with salt and pepper. Place on a preheated grill or grill pan for about 2-3 minutes on each side, or until tender. Spread a thinly layer of the ricotta cheese on each zucchini slice. Top with prosciutto and roasted pepper. Sprinkle with basil and roll. Place on a platter and repeat with the rest of the zucchini slices. Looks tasty and healthy. Nice party app! Thanks. Pretty and yummy! Great idea! Those look so fancy yet are so easy! I love it! A great app! I love how easy and elegant these are! These will make great easy appetizers if you are time crunched. Great idea. I love that you are sharing so many great Italian recipes since your trip! I grew zucchini for the first time this year. Now I have an idea of how to use it! Ooh these look delicious and fun appetizer for the holidays to whip up! I really like serving appetizers that can be made in advance.